The world is an open door. 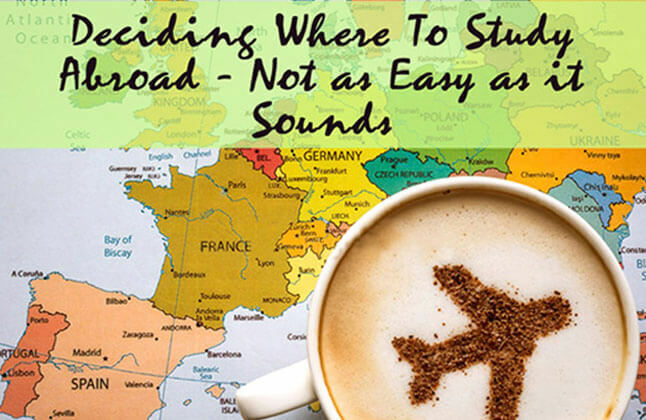 There is a variety of international opportunities for college students. Potential employers see international experience as a qualification in hiring college graduates. Job opportunity, diverse campus experience, peer learning and overall development are the other prime driving forces.The most popular and sought after courses among Indian students are that of business. Jobs in renewable energy have been trending as well. MBA has been a hot field for quite some time; and there are valid reasons for that. Most students look for a major that will help them develop their managerial skills and focus. Graduates with Computer Science Engineering degree and excellent skills on software development, cloud computing, programming and coding are valued everywhere. Accounting is the systematic recording of financial transactions related to a business. It refers to the process of summarizing, analyzing and reporting these transactions to oversight agencies and tax collection entities. The profession of Building Design, open areas, communities, and other artificial constructions and environments. Architecture often includes design or selection of furnishings and decorations, supervision of construction work, and the examination, restoration, or remodeling of existing buildings. Built environment refers to the manmade surroundings that provide the setting for human activity, ranging in scale from buildings and parks or green space to neighborhoods and cities that can often include their supporting infrastructure, such as water supply or energy networks. Digital marketing is marketing of products or services using digital technologies on the Internet, but also including mobile phones, display advertising, and any other digital medium. The activities include search engine optimization(SEO), search engine marketing (SEM), content marketing, content automation, campaign marketing, and e-commerce marketing, social media marketing, social media optimization, etc. Construction engineering is a professional discipline that deals with the designing, planning, construction, and management of infrastructures such as roads, tunnels, bridges, airports, railroads, facilities, buildings, dams, and utilities. The Construction Engineering and Management (CEM) program develops knowledge, tools, and methods that can add value to construction projects and organizations with a focus on risk management. Computer science is a discipline that involves the understanding and design of computers and computational processes. Principal areas of study within Computer Science include artificial intelligence, computer systems and networks, security, database systems, human computer interaction, vision and graphics, numerical analysis, programming languages, software engineering, bio informatics and theory of computing. Electrical engineering is a field of engineering that generally deals with the study and application of electricity, electronics, and electromagnetism. Electrical and Electronic Engineers are involved in advances in medical technology, e-commerce, mobile telephones, wireless communications, renewable energy and the internet. Electronics engineering, or electronic engineering, is an engineering discipline which utilizes non-linear and active electrical components (such as semiconductor devices, especially transistors, diodes and integrated circuits) to design electronic circuits, devices. An engineering discipline that brings together all electrical engineering disciplines including computer engineering with systems engineering to enhance telecommunication systems. The work ranges from basic circuit design to strategic mass developments. The combination of electronics and mechanisms; Mechatronics is an integration of mechanics, electronics, and computer technology produced to enhance products or systems. The addition of intelligence to a mechanical design or replacing mechanical designs with an intelligent electronic solution. Fashion is dynamic, changing in subtle or dramatic ways depending on designers' artistic inspirations, and trends are often born based on style choices of public figures. Tourism and hospitality covers the fundamentals of each industry including tourism economics, food service, and legal issues. This course can help you develop necessary management and entrepreneurial skills to work in establishments related to the field. A law degree is an academic degree concerned with studies in. Such degrees are generally preparation for legal careers; General skills include the research, interpretation and explanation of complex subjects, analytical thinking and practical problem solving, good oral communication, negotiation, teamwork, attention to detail, and the ability to draft formal documents. Study of business and management allows you to develop a broad understanding of business organizations and provides subject-specific knowledge in areas such as markets, customers, finance, operations, communication, information technology and business policy and strategy. It is the branch of science and technology concerned with the design, building, and use of engines, machines, and structures and is the application of scientific knowledge to solving problems in the real world. Human Resource Management (HRM) describes formal systems devised for the people management within an organization. The responsibilities of a human resource manager fall into three major areas: staffing, employee compensation and benefits, and defining/designing work. The Master of Business Administration (MBA) is an internationally-recognized degree designed to develop the skills required for careers in business and management. It can also be useful in the public sector, government, private industry, and other areas.MBA includes accounting, economics, marketing, and operations, as well as elective courses that allow participants to follow their own personal or professional interests. A degree in a technical or quantitative field, such as Engineering, Analytics or Mathematics. A Master of science in nursing. To further enhance your career opportunities and expertise a doctoral degree is needed. A degree in Biology, Chemistry, Toxicology, Analytical, Chemistry, Physics or Forensic Sciences. A degree in biology, microbiology,chemistry,mathematics,anatomy or statistics. For a further career boost, a progessional doctorate degree is needed. A Master's degree in marketing research or a related field, such as Statistics or Mathematics, can help you secure the top job positions. A Bachelor's degree in Biology. Earning a graduate degree in Biology or a realted field may lead to career advancement.